I love desserts made with wontons! I think it goes back to my childhood with McDonald’s apple pies. Remember they were like apple pie egg rolls? So so yummy! They changed their apple pies so I’ve had to get my dessert wonton fix elsewhere. 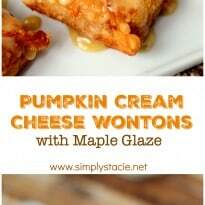 This recipe for Pumpkin Cream Cheese Wontons with Maple Glaze is out of this world. 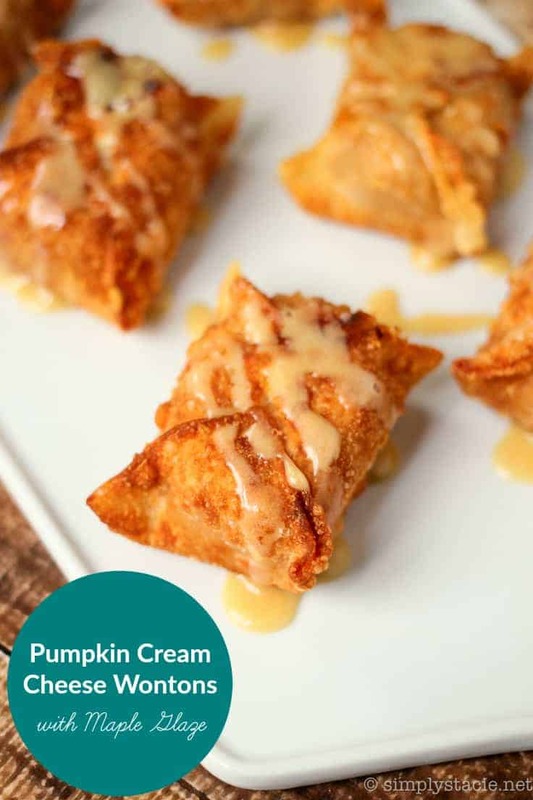 Imagine crispy wontons with a hidden sweet, creamy pumpkin-y surprise inside. Top with a drizzle of maple glaze and close your eyes and inhale. At least that is what I like to do when I eat a dessert like this one. Good thing this recipe makes 24 pieces because I guarantee you’ll want to eat more than one! What is your favourite wonton dessert? 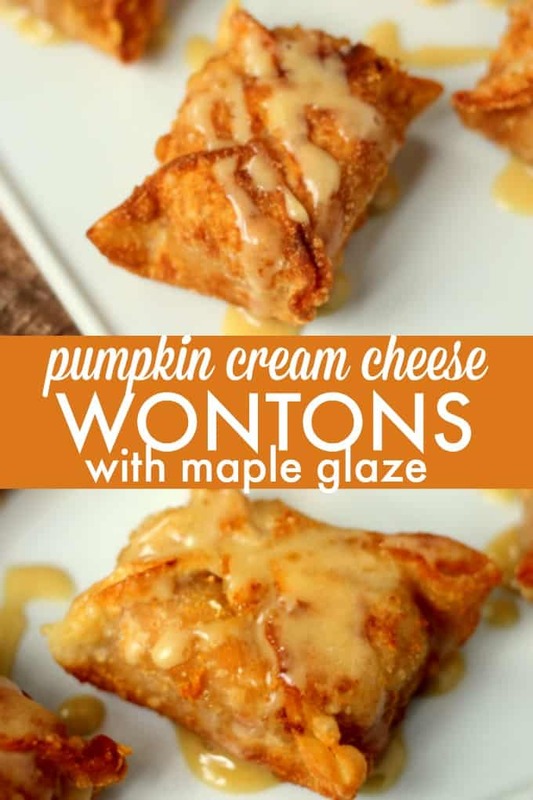 Out of this world delicious recipe for Pumpkin Cream Cheese Wontons with Maple Glaze. You’ll be happy this recipe makes 24 because you’ll eat more than one! In the bowl of a stand mixer (or electric mixer), add cream cheese, vanilla, and sugar; mix until completely smooth and combined. Add pumpkin puree, cinnamon, nutmeg, and salt; mix to combine completely. Arrange a workstation with a small bowl of water, your wonton wrappers, and pumpkin filling. Working one at a time, add about 1 tbsp of pumpkin filling to the centre of your wonton, then using your finger, wipe water across all sides of the wonton. Bring one corner up to the other in the centre, and press together to seal. Then bring up the other 2 corners, and run your finger along to seal all edges. Set aside and repeat for all wontons. In a large stockpot, add about cup of oil (should be about 1-2 inches deep). Heat over medium high heat, and when you see ripples the oil is ready. Carefully drop the wontons bottom side down into the oil and cook for about 1-2 minutes on the first side. When they start browning, use a spatula and flip over. Cook another 1-2 minutes or until crispy. Remove from oil and set on a paper towel lined plate. Repeat until all wontons are fried. In a small bowl, add powdered sugar, maple syrup, and milk; mix together with a fork until smooth. Add more milk to loosen glaze if desired. Drizzle glaze over the tops of the wontons. These look and sound amazing! Will just have to wait a couple months to try them out, need to take a break from everything pumpkin for a bit. I have made cream cheese wontons before. But these Pumpkin Cream cheese recipe looks so pretty and delicious. This recipe would be a great one to take for Thanksgiving dinner. Thanks for sharing this recipe. I am going to try and make these! These look and sound incredible! I’ve always wanted to try using wonton wrappers and this is just the recipe to get me started. I’ve never had a wonton dessert, this is a good one for sure! I’d love to try it! These look elegant and decadent yet I bet they are simple. I need to add them to my Thanksgiving menu! Oh my gosh, these look heavenly! This sounds pretty simple to recreate – and a somewhat fancier looking dessert! Well now I have to go and try these! They sound – and look – awesome. Those look so delicious!! I might just have to make for next Thanksgiving! My mouth salivates every time I see one of your recipes! And this looks like the perfect recipe to fix my pumpkin craving. Thanks! I never thought to make desserts out of wontons! These look so yummy! You said the magic words – pumpkin and maple! Such a delicious combination, and then you pair them with cream cheese and wontons?! Loving the sound of these scrumptious little pockets! These look amazing! I love won ton stuff! These look amazing we will love them. Thanks so much for sharing with Full Plate Thursday!